Now celebrating our 35th year in business! Since 1983, Clothes Heaven has specialized in high quality, high fashion, gently worn designer women's wear. Aptly named Clothes Heaven, "where good clothes go when they're passed on." We believe that fashion is meant to be fun, and we are here to make the search for the perfect piece as enjoyable as possible. We specialize in complete wardrobe overhaul- Our stylists will help you re-define or discover a whole new you. Finding the perfect gift for that special someone- Husbands, look no further, stop in and we can assure you they'll be no re-gifting or returns this year. Ladies, we'll help you find the right piece for a friend, family member, or, who are we kidding, yourself! Whether you are a fashion diva seeking Gucci, Chanel, Prada, and Verasce; an urban princess hunting down Ann Demeulmeester, Helmut Lang, Yohji Yamamoto, and Jean Paul Gautier; or a fashion purist desiring Donna Karan, Michael Kors, Narcisco Rodriguez, and Calvin Klein; our constantly restocked inventory is sure to hold treasures for you! Our store is located in Pasadena, California, an intimate, inviting little shop overseen by personable proprietor Larayne Brannon, who has earned a solid reputation in the art of apparel selection as well as for her talent in helping clients to choose their best styles and colors. Larayne is well known for her ability to always find something to tempt you with! There is a fabulous selection to choose from, and you'll find the most current styles of suits, casual wear, eveningwear, shoes, and accessories. All of our items are meticulously chosen, in superb or gently worn condition. Many are ahead-of-season designer samples; many are new with original price tags. Many of the pieces are consigned from couture representatives, some have been used in studio wardrobes, and others come from celebrity closets, stylists, CEO's of corporations, fashion designers, and models. We receive items from closets in such diverse areas as Malibu, Beverly Hills, Santa Barbara, La Jolla, New York, Arizona, and Texas. We have lots of clients with very different styles. Surely one will be a match for you! We hope to appeal to those of you who appreciate the quality and style of the greatest in designer apparel, but prefer to get them at a fraction of the retail price. If you have any suggestions, praise, questions or comments for us, feel free to email us at shop@clothesheaven.com, or call us at (626) 440-0929. 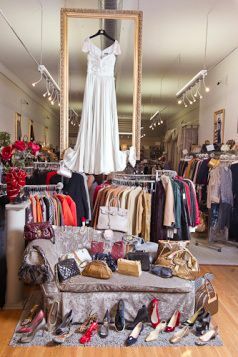 If you are intereted in consigning, we pay 50% of the price tag. Please call ahead to book an appointment with Larayne if you'd like to consign with us. Thanks for stopping by, and happy hunting!